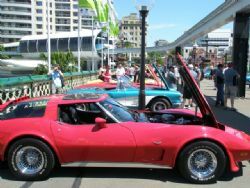 On Sunday 31st October the NSW Corvettes Unlimited Car Club held their Corvettes at Darling Harbour event on the Pyrmont Swing Bridge. 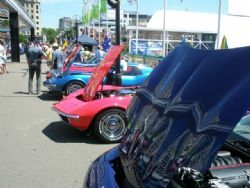 The event was open to anyone with a Corvette and about fifty cars turned up to take advantage of the sunshine and great location. The club ran a show n shine with the proceeds of the day going to charity. I was keen to see what cars turned up and I wasn’t disappointed with everything from C1’s through to C6’s in attendance. There were a couple of C1’s basking in the sunshine and my vote would have gone to the pristine blue with white coves ‘58 that would have also got my vote on the car I would most like to drive home. Superb paint, panel gaps, restored interior and a set of classic American Racing mags made this stand out amongst a high calibre field. There were a couple of outstanding convertible C2’s present and their owners were only too happy to have a chat with any interested parties. I was interested to know if the owner of the light blue 65 had offset trailing arms on the rear to allow him to fit 17 x 8 Torq Thrust wheels all round and he assured me the trailing arms were factory. 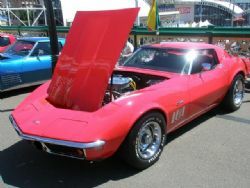 A midyear drag car rounded out the C2’s and the owner at one point fired it up and I am sure they would have heard it in the IMAX theatre! Most years in the C3 line up were in attendance with plenty of chrome bumper 68 – 72 cars on show. Big blocks, small blocks, manual, auto, left and right hand drive, original through mild to wild customs and every body style including a station wagon conversion! Not to be outdone the C4 contingent was well represented, again with all the body styles and a few ZR 1’s and LT4’s to spruce things up. A lot of the C5 owners looked as though they had spent a lot of time cleaning and preening their cars as they all appeared immaculate. 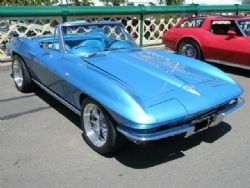 A new C6 blue convertible attracted plenty of admirers and there was a healthy crowd of people flowing across the bridge delighting in the spectacle. One of the nice things about this event was most of the owners were around so you could ask questions and none of them had that jaded go away look. Very friendly, great venue and as always the cars were the stars. If they do it again next year at Darling Harbour it is well worth a look as the wife and daughter had plenty to keep them busy which allowed me a couple of hours of ogling, dreaming and chatting.